As far as web pages go, this one is quite inconspicuous. It’s a plain white page, adorned with simple black font and classic internet blue hyperlinks. It contains the type of spelling mistake which might make the casual 2013 web browser infer it to be a spam site. It is however a long forgotten relic of the internet – the closest thing to uncovering an internet fossil that you will get. The word is misspelt because Sir Tim was using the page to demonstrate the internet’s editing functions and the page in question dates back to 1991. 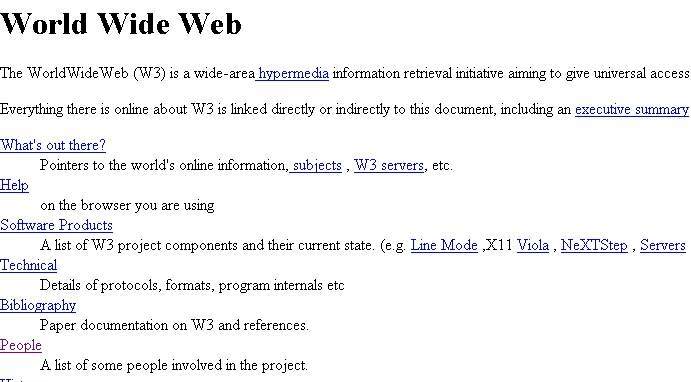 It has been uncovered as part of an operation to find the internet’s very first web page, a project led by Cern who made a public appeal for original web files. Many similar web pages dating back to the days of the internet pioneer are thought to exist, but their passwords are long forgotten and nobody thought to chronicle their early internet work. That leaves this 1991 web page as a truly unique find, amplifying its value. 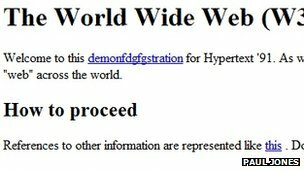 Cern have been chasing down these sort of web pages since April with the aim of launching an online exhibit which will allow us to experience what the internet was like in the early 1990’s. Work began on the World Wide Web in 1989, with the first web page launching in 1990. However this page has not been recovered because the original pioneers simply over-wrote their old pages with fresh updates, so no records are thought to exist. The page found was created by Sir Tim, the father of the internet, with the aim of drumming up support for his fledgling web idea. The spelling mistake pictured is there because Sir Tim had carried out a live demo in which he changed the writing on the screen for his audience – an edit which he never corrected.